Wear an abstract reminder of the passage of time with this simple bracelet. 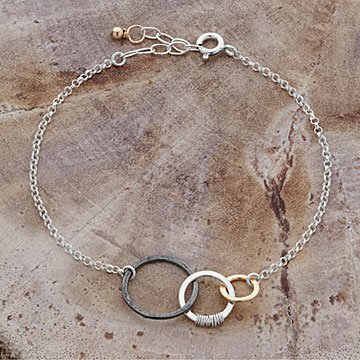 Jewelry artist Beth Lawrence captures this passage of time in her elegant bracelet. It has three interlocking circles: a muted, oxidized ring represents the past; a sterling silver ring wrapped with a band of silver wire captures the present; and a shimmering, gold filled ring represents the future. The three are held in place by an understated, silver chain. More than just an elegant accessory, the bracelet offers a constant reminder to live in the moment. Included is a card explaining the bracelet's symbolism. Handmade in Nashville, Tennessee. Make it a set! Click here to see the matching earrings and necklace. Always store it out of the open air and keep it away from chemicals such as sunscreen, hairspray, perfume, etc. Clean your jewelry periodically with a jewelry polishing cloth to remove skin oils and to keep it shiny longer, but take care not to rub the black silver too much. See above comments as to the reason why I am buying another one. This bracelet was perfect for my mother. She has small wrists and it fit perfectly. This bracelet is very tiny- it could fit my 6 year old's wrist. It will work for a small-boned woman. It is also very delicate and rather insignificant looking. I bought it for my daughter's teacher, and am questioning whether and how to present it. I feel that I need something else to go with it. Love this bracelet! It is well made, comfortable to wear, affordable, and represents something meaningful to me. I wear it all the time and gets lots of compliments. Definitley buy from this artist. Loved this bracelet! Hope to buy the earrings and necklace someday! It is a gift for my wife of 37 years. I liked the representation of our past, present and the future. The recipient loved how delicate the bracelet was and the sentiment attached.